Autism Language Learning (A.L. L.) includes real-life videos of children and teenagers modeling a variety of common actions (eating, drinking, throwing) with the option to record user productions for each prompt. There is an in-app purchase upgrade ($1.99) which allows users to upload their own videos. Sentence Construction – Connell (1982) introduced a procedure to introduce beginning sentence construction using present progressive “-ing” verbs (i.e. eating, jumping). A.L.L. 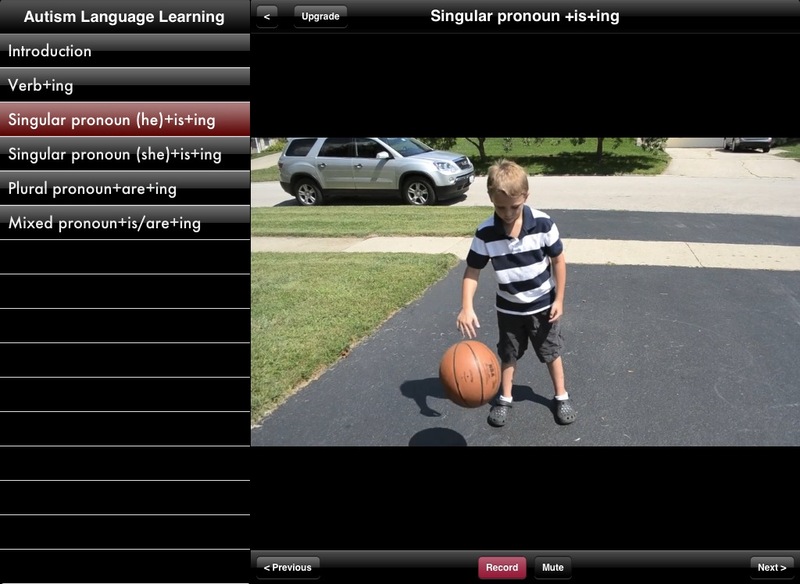 includes 35 videos demonstrating these verb forms which an SLP can use to model correct sentence formation (subject + verb + object), then record the student’s production in the app. To modify the app for more naturalistic context based on Fey’s (1986) continuum of naturalness, you can record the client in the videos performing every-day actions in a less-structured environment. Video Modeling – Charlop-Christy, Le, and Freeman (2000) found children who watched peers interaction in social situations or view scenes demonstrating appropriate behavior increased social functioning. While the videos in A.L.L. serve to increase vocabulary by demonstrating actions, the capability to upload your own video creates opportunities to record appropriate actions/behaviors in the classroom, community, or social situations. With the $1.99 Upgrade package, you can upload your own video and use within therapy. The videos are all silent, which I do not mind. The noises might distract from the content of the video, especially when focusing on the behavior, not the communication or expressions. The videos are short and to-the-point. No ads or distracting noises. The actors/actresses in the video are children or teenagers demonstrating the actions. Very relatable for younger audiences. I like the organization of the app when targeting pronouns. The A.L.L. Action series only takes up 188 MB, relatively small considering there are several videos (to compare, Angry Birds takes up 356 MB). Upgrade: With the higher price-tag of $26.99, I would like the “Upgrade” personal video upload to be included. Not sure why it is not because it is a great addition to the app. Also, there are only 35 vidoes which seems low for the price paid. Variations in Organization: While the app makes it easy to illustrate actions based off pronoun use (he vs they), If I wanted to target specific action videos, it is not easy to find ones like “eating” or “drinking” unless you go through each section. Alternately, including a Settings page to turn videos on/off for the same reason. Text: The option to show/hide text for each action, either just the action (i.e. “Eating) or the complete sentence (“She is eating”). *In the next update for A.L.L. : Actions, the developer plans to include data collection. (yay!) This will make a great addition so stay tuned! Article of Interest [full text]: Fey, M. E., Cleave, P. L., & Long, S. H. (1997). Two models of grammar facilitation in children with language impairments: Phase 2. Journal of Speech, Language, and Hearing Research, 40, 5-19. I did receive a complimentary copy of Autism Language Learning: Actions for review, however the evidence referenced, suggestions, and critiques are all my own ideas. Get your copy of A.L.L. : Actions today! I work in an early childhood setting and I use this app every day with all the kids. They love it and I love it! If I bought this app in a book format (only I couldn’t because this app is live video), I would have to pay $30.00 or more. I would pay almost anything for this app!